Grants from the New Hampshire State Council on the Arts are a public investment in the cultural life of our state. Each competitive grant category is designed to meet an important purpose and need, and aligns with our current Strategic Plan. Before applying for a grant, it is very important to learn about the requirements and obligations of a grantee and read the guidelines carefully. Click here for a list of Grant Basics, with information on how the grant application process works, grantee responsibilities, a glossary of grant terms, frequently asked questions, information on the online application system and grants workshops, some grant writing tips, as well as information on setting up a nonprofit organization. Arts grants impact our communities in many ways, helping to promote a lively economy and enhance the quality of life in communities. 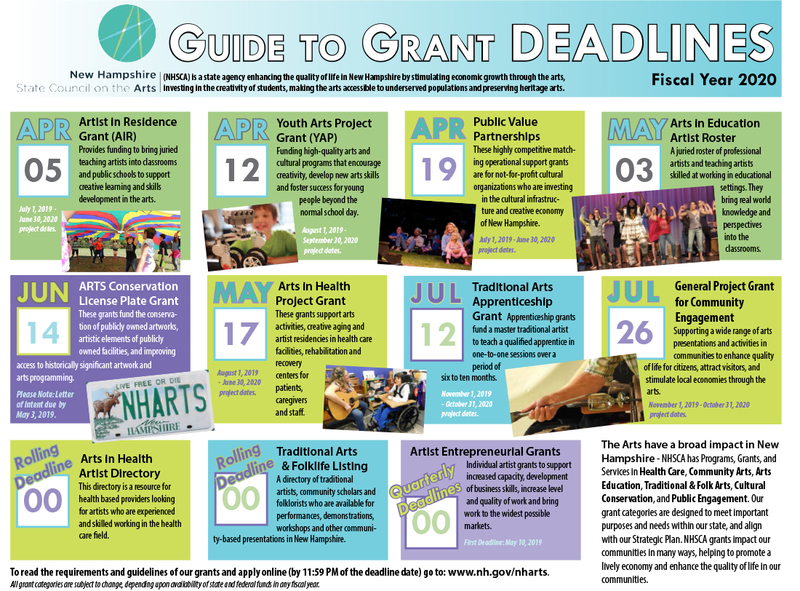 To learn about previously funded arts grants and the impact they have in New Hampshire, please click here. As a state agency and steward of public funds, we strive to be intentionally inclusive of underrepresented communities, to build diversity and access to arts programming, including socio-economic factors, age, sexual orientation, ethnicity, geography and ability. For FY2020, we have removed the matching requirement for schools that serve a student body at or above 40% free and reduced lunch. We have reviewed our guidelines, application and panel process to remove barriers for all eligible applicants. We invite applicants to contact us with any questions or concerns about perceived barriers, so we can continue to make our grant process more accessible and inclusive. To learn about our current grants and opportunities, check the chart below. NHSCA is using an online application system, Submittable, for all grant programs, artist rosters and final reports. Please click here for instructions on how to use the online system, and click here for workshops/webinars about our grant programs and the application system. Grant and opportunity applications are adjudicated through a peer panel review process, based upon the concept of public input on the expenditure of public funds. Individuals with relevant art form and/or arts practice expertise are identified and asked to serve as panelists for each grant/opportunity category. Panelists review grant applications and work samples submitted, discuss applications, evaluate them based upon published criteria, and utilize a numeric system to rank them. Rankings are compiled by staff and used to determine funding levels for grants. Panel rankings are conveyed to State Arts Councilors who approve grants for funding. Cumulative grants to individuals over $5,000 and non-profit organizations over $10,000 must be approved by the Governor and Executive Council.